The Clean Energy Regulator has welcomed 2014 with news confirming Australia has now installed more than two million small-scale renewable energy systems, under the Renewable Energy Target. This comes only eight months after reaching one million rooftop solar installations, providing a strong indication that investment in small-scale renewable energy continues to flourish in Australia. Assisted by falling system costs coupled with financial incentives derived from the Renewable Energy Target, small-scale systems have become more and more affordable for everyday Australians. The Clean Energy Regulator estimates the two million small-scale installations have a capacity to generate or displace approximately 6,882 gigawatt hours of electricity annually, with 4,182 gigawatt hours generated from small-scale solar, wind and hydro installations and a further 2,700 gigawatt hours displaced by solar hot water systems and air source heat pumps. This equates to the amount of electricity required to power approximately 1.04 million Australian homes for a year. This is enough to power all Perth, Hobart, Darwin and Canberra households combined1. It’s an impressive message. Heck, why equivocate, it’s an impressive achievement. That’s a lot of systems, that’s a lot of electricity, and that’s a lot of energy. To add one more stat, it’s national household penetration of PV of about 14%! All told the impression one takes from the media release is that it is boom time for solar. Is it? Or might this be a governmental “goodbye and good luck”? No doubt Australia’s solar story is far from finished. 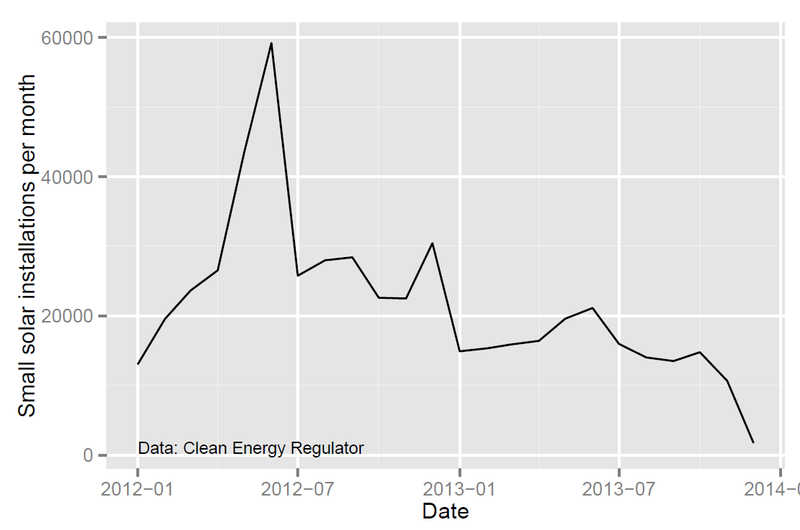 However right through to 2014 solar PV installation rates remained highly sensitive to Government support. They simply are not that cheap. These factors are further reasons why new installations may be harder to come by from here. For commercial and industrial roofs, the dramatically lower prices paid for electricity tip the balance against solar far more than residential customers. That potential boom frontier remains out of reach for the time being. Geoff’s simple analysis is important to help us see the whole picture. If we don’t, we risk making assumptions about the business-as-usual future that simply won’t be true. Eighteen percent of separate households and 4.1 GWh of electricity… if we were wanting solar power on Australian roofs, it has worked. We’ve got solar. It has been bumby, however since the Photovoltaic Rebate Program was introduced in 2001 we have had 13 years of sustained support in the form of rebates, renewable energy certificates, artificially multiplied certificates and feed in tarriffs. The inarguable popularity of this technology has seen people-power campaigns repeatedly thwart attempts by both major parties to remove financial support. Between solar PV, wind (which delivers in excess of 5 TWh of clean electricity), and some softening demand, Australia’s electricity emissions have returned to 2003 levels of…186 Mt per annum from a 2009 high of 209 Mt per annum, while total national emissions have climbed. We wanted solar and we’ve got solar. Now we need something else and it will need to be big. Next Entry It wasn’t this hot when I was a kid… was it? Is there a parallel between an individual outlaying thousands in capital and a coalition of utilities outlaying billions in upfront capital to build PV and Nuclear stations respectively? Especially considering that a FiT (strike price) will sweeten a shift to adopt that technology? Maybe this is a way to explain Nuclear costs to the average person, or maybe I haven’t had enough coffee this morning? George Orwell warned us of ‘doublespeak’ . I see the 2m is made of 1.1m PV roofs, 0.7m solar water heaters and 0.2m heat pumps in rounded figures. Since when was a heat pump water heater a solar device? It could be mainly powered by coal and gas fired electricity. Maybe it’s ‘honorary solar’. With the reduction in incentives like Australia wide feed-in tariffs falling to 8c or less per kwh we may never get to 2m PV roofs. On another tack I saw in an article in Climate Spectator that a SA Parliamentary Select Committee had looked into the Pt Augusta solar thermal proposal. Since the hyperlink is flakey search and download the pdf file Pt Augusta Power Stations Interim. The recommendations seem quite level headed ie consider alternatives both technology and Pt Augusta. It makes me think SA politicians aren’t quite as starry eyed as we suppose. When the gas price shock hits with 50C summer temps perhaps nuclear will get serious consideration. The big issue with that committee was it was spurred on by the BZE Repower Pt Augusta proposal of 760MWe of Solar Thermal and 700MWe of Wind to replace both Northern and Playford B but only considered in the end a single 110MWe Solar Thermal (with storage, maybe?) plant. The entire point of the exercise was forgotten by the end of the Committee hearings, as ti became apparent that the original proposal wasn’t was robust as the members of the committee were led to believe it was. If they had pressed with the 700MWe of Wind they would have been rebuffed by grid operators as there is no more capacity for large scale wind. So the options were either scrap the Wind and that would compromise the original goal of closure of N&P, or contribute more millions to upgrading the SA grid effectively gold plating it and adding to the cost of SA power prices (due to the AER rules). The Ceres project (600MWe) on the Yorke peninsula had to build it’s own sub-gulf HVDC cable to link into Adelaide to get around this problem. There were clues to this earlier on in the committee hearings where the Repower Pt Augusta people were asked if the had consulted with local land owners to see if placing 6 solar thermal arrays around Pt Augusta was feasible and had land access agreements, they had none and it became clear after the hearing that the proposal was effectively back of the envelope, albeit on a flashy glossy envelope. This is why the current committee scope is directed towards building on the existing site. Which would mean either an outright 110MWe w/6hr storage Solar Thermal platn (unlikely; although Solar Reserve is poking around), or a Solar Booster like Kogan Creek. With the plans to increase the life of Leigh Creek and the blending of low grade Coal with the current high grade stockpiles boosting the steam looks like a likely option. Let us all bask in the Green Wash Kool Aid. OOOOHH YEAH! More proof that SA is on the same wavelength as Germany….burning coal is OK if you feel green inside. Thanks, full credit to Geoff for passing through the information. What that really says is that we desperately need the SA-VIC interconnector to be massively upgraded. There’s still heaps of wind capacity there and there’s heaps of brown coal in Victoria just waiting to be undercut on cost. Who cares whether or not it’s the coal plant in Port Augusta or one of the ones in Victoria that’s having its energy replaced by wind it’s still less emissions being released. While SA might be close to maximised in terms of wind it can handle on its grid the rest of the NEM is miles off. Just wanted to add that when we have capacity issues here we tend to import a lot of Victorian Power (i.e. Hazelwood and Loy Lang) over gas because it’s cheaper. Does the solar powered electric fence energiser I bought a year or two back figure in the stats? Its panel is a whopping 200 x 120mm or so. Solar in Australia’s interesting. I think it’s a great case study in the impact of plummeting solar prices and rising electricity prices on the population’s outlook as well as being a great example of how to destroy any semblance of stability in a sector through poorly planned government subsidies. First of all the rate of installation is unbelievable. 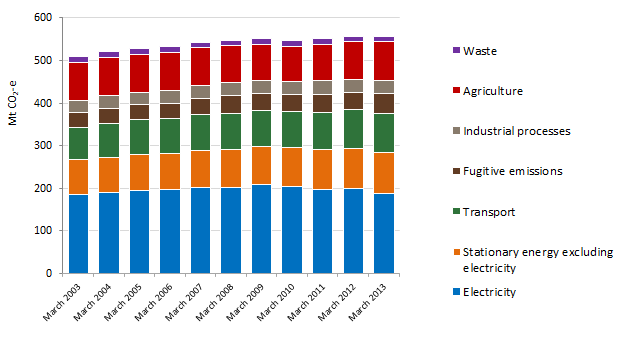 In 2008 there was less than 30MW of capacity installed yet in 2012 there was over 1GW. Of course suddenly the FITs that were supposed to make systems of the 2000s remotely cost competitive were making 2012 systems basically a gold mine. Add in spiralling electricity prices from the grid and the government was massively caught out by the take-up rate. Then we’ve gone through massive peaks each time subsidies are dropped since. The flat FITs meant the government subsidised far more than necessary certain systems and led to dashes to take advantage of them. It would’ve been much better for the subsidies to be gradually dropped as the price of solar decreased. Now the solar market has to go through a period of consolidation. There are some interesting plans to get around some of the things you mention like such as solar leasing and nice methods for getting around roof ownership problems for business installations. Solar’s still got a lot of growth though. With dropping costs and increasing prices from the grid they’re only going to get more competitive. It’s only taken 5 years to come this far. There will probably be a short lull but I’d be surprised if in 10 years time solar wasn’t the norm for houses (it’s still the exception). Of course that doesn’t mean other forms of clean energy shouldn’t be considered as well. Very much so. There has normally been a month or two of notice, and the vendors spruik the “get in before it closes” very openly. So you can see spike, lull, then build to the next spike before the next closure. Overall trend is very clear. When you could get REC multiples and feed-in tariff, and system prices were falling, solar PV in Australia was a financial no-brainer. On the Heywood connector I don’t see why SA couldn’t send both wind generated electricity and nuclear power to the Victorians and their dark satanic coal mills should they decide to cut back. At some point SA’s gas fired generators will have to be used more sparingly but hopefully not from importing Vic coal power..
Electric fence zappers are the sort of off grid low power application at which solar excels. Beats me why they then think solar should power aluminium smelters. I’ve had a read of your report proposing nuclear in Port Augusta. It’s a very interesting report and important that there’s actually a reasonable analysis of all possible options. Whether or not nuclear ends up a realistic candidate to significantly eat in to fossil fuel consumption in the near future, not considering it at all is moronic. So good job on getting a conversation started that hopefully will lead to a more reasonable debate. 1. Do you think the $5,000-$7,000 per kW is still reasonable for nuclear? Recent plants in western countries seem to have been higher than that with, for example, Hinkley C construction costs are over $9,000 per kW (I understand at least part of that is due to the exchange rate shift since your report was written). 2. You mention that the maturity of a nuclear industry affects costs but don’t go in to detail (at least I don’t think you did). Realistically how much more do you think it would cost to build a nuclear plant here compared to places with an existing nuclear industry? Along with that what sort of investment (in terms of time and dollars) would we be looking at from the government in order to set up university courses, safety agencies, etc to get a nuclear industry started? Note: I realise these costs wouldn’t be born by a single reactor since surely if we’re going to the effort to build one we’d end up building a bunch more. 3. Why did you choose a CANDU-6 reactor? I’m not criticising your choice I’ve just got no knowledge of why that reactor would be a good choice over others and if you explained that in the report I must have missed it. 4. You make the argument that solar thermal electricity is expensive, which it certainly is. However it does have some significant advantages due to storage. These include the ability to sell to market when electricity costs are higher and also the ability to improve grid stability. Do you know of any studies looking at the impact of this and when solar thermal with storage would become viable? Also do you know how much grid stability it could provide, for example how much extra wind could be built on the grid around there due to the solar thermal plant providing the stability? I hope that’s not too much for you and again thanks for the report. Thank you for the feedback, that is much appreciated. Yes, we saw no benefit in overstating renewable expense, so we stuck to prices quoted by renewable advocates. If anything the process of this report enhanced my appreciation for the role of wind to keep the decarbonisation process going, up to a point anyway. 1. Yes. Provided one continues to look at the full spectrum of global prices, and provided Australia runs a competitive process with international consortia, I think that’s perfectly reasonable. I am still trying to pin it down but I understand that for a lot of historical reasons it was only ever really going to be EDF who would build new nuclear for the UK. We don’t have that problem. Would could have competitive processes with tenders lead out of France, USA, China, Korea, India and several others. The recent price for connected EPR reactor in China was astonishing, $2,000 per kW. 2. Wow, good questions. Less than most people think. International labour makets are a fact of life and it’s just the case that when Australia can’t provide labour, in industry after industry, we buy it. If we want to do it sooner not later we can buy a turn key solution such as Kepco have provided the UAE, linked to domestic training and development so that we become more autonomous over time. That said we should get better domestically to get the most out of the opportunity in terms of jobs. Our regulatory systems and bodies are actually really really good, really highly regarded and really competent. They are simply sized structured for what we have now which is an excellent research reactor, a lot of nuclear medicine and a large mining industry. It would be far from starting from scratch. Our existing regulators would need to be bigger with a broader remit. 3. It was discussed, but briefly. Please see top of page 8 and pages 22-23. 4. I don’t really see this as an advantage per se, I see it as solar power gradually mimicking what fossil fuels and nuclear power do as a matter of course, which is provide a dispatchable supply. If you want to hook up salt storage to nuclear, you could, but it’s hard to see why you would. The storage element really pushes up the price, and note the prices in our report would based on (from memory) on 8 hours or so which is really not adequate. All that said the recent AETA update published by BREE suggested much swifter price falls for solar thermal with storage than it had in the previous version. It’s still farking expensive unfortunately and beyond AETA I don’t have insights into the potential for that to change, sorry. Thanks again for reading and discussing! Lots of work went into it. On point 2, Australia already has a good base of Nuclear Engineering and Science (Lucas Heights, UNSW, Silex) to go off. So in effect a turnkey solution like UAE would work much more effectively here as there is the engineering and science base to go from. Thanks for the time and effort you put in to this. I really appreciate it. 1. Fair point about competition for tenders. Hopefully that would reduce costs. Of course all of these are still a number of years away from completion and the first 3 are way over budget. Now perhaps a more basic, ready to go design will make it cheaper. I don’t know. But surely you can understand my scepticism of the predicted costs when existing nuclear countries are struggling to build new nuclear for that price. 2. That makes sense. I hadn’t even thought of our existing nuclear industry. I guess it would just be a case of expanding what’s already there rather than starting from scratch. Having education incorporated in to the tender process would make a lot of sense. 3. Thanks for that. Somehow I missed it on my first look through. I must say, with a bit of research CANDU-6 reactors seem to have a remarkably good record of being on time and budget compared to the nuclear power industry as a whole. 4. I think you undersell the importance of dispatchable power. For example coal definitely can’t deliver grid stability since it takes such a long time to power up and down. I was under the impression nuclear power used similar generating systems so had the same problems (I could be wrong). Additionally I don’t think LCOE takes into account the possibility for electricity to be sold at times of peak wholesale prices. Although solar thermal with storage costs a lot more to generate, it also has the benefit of being able to choose when to distribute the power which means the plant can make more money off the power it sells than baseload plants which have to sell their energy for whatever the price at the time is. You’re right that 8 hours storage would limit this although it would allow them to cover the evening peak even if that’s after sunset. Of course you’re right that it is still very expensive and I doubt that these positives even go close to making up for that. Certainly! And I would encourage you to keep that sceptism at all times. Cost certainty is, for me, just about the only uncertainty remaining in nuclear and I maintain sceptisism myself, hence my Hinkley piece. As the data sources change so would my analysis. More importantly for China has been the learning. They are getting cheaper, fast, which is a very good sign. All said, I remain entirely open to people being sceptical in this regard. If that becomes the status of nuclear discussions, I think that’s excellent. 2. Those organisations present that the mid-year ATSE conference spoke highly of their abilities and were confident in an expanded role. The positive you are describing for solar thermal… still not getting it. Solar thermal can, as you say, choose when to sell the power it generated earlier in response to price. A nuclear plant can choose when to make power in response to price and sell it on the spot. I would say nuclear is in front there. Are talking about oversizing the solar thermal to provide both constant supply at X MW PLUS a neat little reserve of stored power to sell when you want? I can’t see that happening. The point of solar thermal is to provide constant supply with dispatchability, like fossil or nuclear. The generation that is economical for taking advantage of the real price spikes is open-cycle gas. Thanks for the reply. Just on solar thermal I’ll try to explain what I’m getting at. You’re right that nuclear could target high cost times by switching off the generators at other times. But that’s a different way of targeting high prices than solar-thermal potentially could. Hypothetically let’s say that for 12 hours are day there is a high wholesale electricity price and half the day is a low wholesale electricity price (of course this isn’t realistic but it’s useful to demonstrate the point). So nuclear targets these high prices by switching off its generators for the other 12 hours a day. But that hurts the LCOE of the nuclear generation. The LCOE assumes a high capacity factor for nuclear (85-90% I think). But if you’re not producing power for 12 hours a day then your capacity factor is 50%. As you’ve noted many times, construction costs are a huge part of nuclear power costs and you’re paying these costs for the reactor to not be producing power for 50% of the time. A plant designed to last for 50 years won’t suddenly last for 100 years because you aren’t using it half of the time. Sure there might be some cost reduction (perhaps the plant would last slightly longer or you’d save some money on fuel costs) but these would be minor. Overall your total costs over the life of the nuclear plant would be split over less electricity so each kWh would cost more. Make sense? Solar thermal isn’t the same. Storage allows them to sell electricity at times of higher prices without ever stopping collecting the suns rays. The capacity factor doesn’t change so they still produce the same amount of electricity so the LCOE doesn’t change but they can sell it at more optimal times. If you had perfect storage you would take the energy generated by the solar thermal plant throughout the year and just release it at times of huge demand meaning on average you’re selling the electricity at far higher prices than a baseload plant which produces constantly year-round. This is without reducing the total amount of electricity generated over the plants lifetime. Of course there isn’t perfect storage and limits in terms of the amount of storage capacity, the time it can be kept for and inefficiencies in storage would mean the impact would be far, far reduced from the optimal case. But it would make a difference. I’m not saying you should’ve covered that or that it would make solar-thermal even remotely cost competitive. But it is a benefit of having storage and I’d be interested to see just how much of a difference it could make (my guess is that with only 8 hours storage and an inability to dispatch the stored energy in particularly quick time, the impact wouldn’t be great). James, one doesn’t “switch off” nuclear reactors. In practice, there’s nothing to gain and much to lose by not keeping the steam circuit hot and operating, even if at low loads. You used the term twice. You are correct that it comes down to capacity factors, amongst other issues. Your description of solar thermal reads as though you can store heat without cost, as well as harvesting it and using it immediately. This isn’t realistic. First, any heat diverted to the storage salt is heat not available for the generators immediately. I have read a few estimates of the thermal losses expected from storage and subsequent withdrawal from storage of heat. It isn’t trivial – something like 30% from memory. So, if a solar thermal plant which is rated at 1MW (direct to turbine) receives sunlight for 8 hours per day average, it may have a 33% capacity factor. If half of that is cycled through storage, then the capacity factor becomes 33 – (33*0.5*0.3) = 28%. So, that what you really want, complete with additional need to provide alternative (gas?) power supplies for overcast days, plus conventional immersion heaters to keep the salt above its hardening point when there are a few overcast days in a row? While you are considering losses, remember that the solar thermal plant also needs to stay hot overnight, or lose at least the first hour of every day just heating its steam mains and turbine through, ready to start work again. Of course, you don’t want the steam mains to cool down every day — 365 cold starts per annum are exactly what a steam turbine does not want, if the objective is to live a long life. Ditto the steam mains themselves. One way to think of steam plant is that it is good for “X” starts from cold. Keep it running constantly and it doesn’t get damaged due to differential thermal stresses and strains. How are you going to keep your steam mains and turbine warm when the sun isn’t shining? How are you going to explain to your shareholders that you stuffed a perfectly good turbine by starting it daily, then allowing it to cool? Some engineers even recommend keeping the whole animal turning over at no load, 24/7, using natural gas to generate the steam to enhance the plant’s availability, flexibility and longevity while decreasing maintenance costs. A few years back, a solar thermal plant in Spain was observed to be running a diesel generator 24/7 down the back yard. Connected to the grid, which was a bit of a give-away, because they were generating beyond their technical specifications. Naughty, but nice, if the objective is to generate not electricity, but a set of nice looking availability and capacity factor results. Before you jump onto the solar thermal bandwagon, take a long, hard look. It’s not as easy as at first it appears to be. I was referring back to Ben’s comment “a nuclear plant can choose when to make power in response to price and sell it on the spot”. Of course you don’t shut it off completely but that suggest altering generation output to match prices as being a realistic possibility for nuclear plants. I’m not on “the solar thermal bandwagon”. I try not to be on any bandwagon. At the moment solar thermal seems vastly more expensive than other forms of generation. I’m simply interested to know the economic impacts of storage. I was simply showing to Ben how including storage in an LCOE could potentially leave an energy source appearing more expensive than it really is. If there have been any studies on the economic impact of storage for solar thermal I’d love to see it. Depending on the quality of the storage it could improve the overall economics of the plant. Alternatively it could be a case that storing energy costs extra due to inefficiencies in teh storage process. Either way I’d be interested to see if there’s any information on that and what sort of improvements can be realistically expected in the near future since I can find very little on it. So we were discussing ramp rates, not turning on or off. All plant with steam generators can ramp up or down within predetermined parameters – typically 20 – 30MW/min loading for a 500MW unit, perhaps more when unloading. Nuclear, solar thermal, gas (CC) or coal fired, they are all able to follow loads up and down. Philosophically, there’s not much between them in this regard. 4. Where do you think grid stability comes from now? It is from coal sure they do take a long time to start from cold, but once started and warm are what hold the grid together now. On checking I see that Pt Augusta’s Northern and Playford power stations got $59.5m in 2012 under the ‘contracts for closure’ program. That’s cash not free permits or IOUs. I note the Playford station is under care and maintenance for a quick rebirth ie they’re not demolishing it. If Northern gets a solar boost (like Kogan Ck Qld) we’ll not only have a rather feeble greenwash but what seems like taking money under false pretences. My feeling is that Pt Augusta is a coal town and will be for a long time. Re First of a Kind (FOAK) costing. This is always a conundrum for any industry, more so for politically complex ones. Relatively recent experience in trying to put together a contract for a Chinese company to design, construct, operate and maintain, then hand over, a power station to be constructed in Mongolia, indicated that not only finance and engineering are involved, but also politics, language and cultural differences. Those two countries are strongly reliant on trade partnerships but also have a complex and adversarial history. The same issues will arise to varying degrees with any FOAK source country from Ben’s list of France, USA, China, Korea, India and others. Even if USA is the supplier’s home, there will be differences regarding regulation of OH&S, environment and industrial relations that will impact daily. Australian engineering standards may not apply to the heavy engineering, but the Building Code of Australia and a whole swathe of Australian Standards will have roles across the site, as also Australian regulators and local, State and Federal authorities. Training or retraining of operators, which is sometimes portrayed as the major roadblock for Australia’s first nuclear build would, in my opinion, not be a major problem. Examples of similar challenges in the past include the first of many Japanese-designed large steam boilers, turbines and control systems which are now the mainstays of the NEM coal-fired generators. Despite language issues and the lack of familiarity with the plant, they went into service smoothly and have been reliable. In practice, there was and is no discernable difference between the FOAK and subsequent installations within a family – eg the dozen 660MW Toshiba/IHI units installed in four NSW power stations. Similarly, earlier this decade a solar thermal array which was designed in Germany and constructed by a mixed-nationality team including German and Spanish specialists suffered delays while the design was harmonised with local constraints, but the novelty of the plant and once-pressing issues relating to distant, foreign language designers are now irrelevant memories. I won’t estimate the FOAK penalty which should be expected for the first Australian nuclear build, but I do expect it to be less than some observers currently expect. The trick is not to buy a new design as the first build. Stick to design(s) that have been tried and proven and don’t fiddle too much with them. Want to read more? Google EPC purchasing (Engineer, Procure and Construct), although the on-line information can be pretty poor. Put me down as an optimist. Solar thermal for Port Augusta has been given the thumbs down according to my local member who is on the select committee looking at replacing Port Augusta with a better alternative to coal. I presented to the committee immediately after the solar thermal advocates and suggested this was a good time to get serious about nuclear. All five on the committee [3 Labor,2 Liberal] were all,favourably disposed towards nuclear. If anyone is interested, please tune into ABC Radio National next Sunday, Feb 9th at 7.45 am and hear my fourth and final Ockhams Razor talk promoting nuclear power for Australia.By the way, I’ve just published my second book, Walking with Warren, during one half life, an autibiography of the second half of my life. Mostly it’s about all of my adventures in the desert with Warren Bonython plus a few chapters on other issues and people important in those 38 years. There’s a chapter on nuclear power. It’ll cost you $40 including postage if you’d like a copy. FWIW I don’t think Pt Augusta is the right place for either desalination or large (1GW) seawater cooled thermal plant. I see someone is reviving the idea of a canal to Lake Eyre to green the desert. More like an elongated salt evaporation pond I suspect. I’ve walked parts of the Bonython Trail. Terry I have an email address for you but it seems to bounce. I’ll order the book if you can advise of me of a working email address. Can’t fathom why my address doesn’t work for you although one other person seems to have the problem.Please advise your postal address[I thought I had it but can’t find it] and I’ll send you a copy. It’ll cost $40 which includes postage[$13]. You can send a cheque [ made out to T.B. Krieg] or pay direct into my a/c 105:036:096796640 which is Port lincoln Branch of Bank SA. Very interesting article. Solar power is a great alternative to coal energy…of the conditions are right. I agree that something big is needed that offering an energy efficient and sustainable product available to those who do not factor into this solar “boom”. Time will tell which energy source will prevail. Hey that rhymed!